In a large skillet, cook beef or turkey over medium heat until no longer pink; drain. Transfer to a large serving bowl. 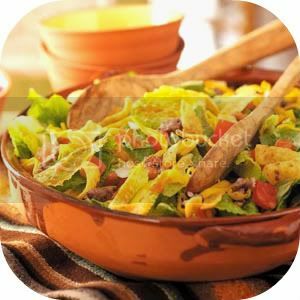 Add the cheese, beans, tomatoes, onion, romaine and corn chips. Drizzle with dressing; gently toss to coat. The next recipe I highly recommend would be Stuffed Peppers. My sister-in-law made these one time, and they were SOOO good. She actually substituted the meat for rice, and other veggies. I haven't tried turkey meat yet, but the thing about this recipe is that you can take out and add as many things as you would like... :)She found this recipe on CookingLight.com. Cook rice according to package directions, omitting salt and fat. Set aside. While rice cooks, cut tops off bell peppers; reserve tops. Discard seeds and membranes. Place peppers, cut sides down, in an 8-inch square baking dish; cover with plastic wrap. Microwave at high 2 minutes or until peppers are crisp-tender. Cool. Heat a large nonstick skillet over medium-high heat. Add beef and the next 5 ingredients (beef through allspice); cook 4 minutes or until beef is lightly browned, stirring to crumble. Remove from heat. Add rice, 1/2 cup pasta sauce, and cheese to beef mixture, stirring to combine. While beef cooks, combine 1 1/2 cups pasta sauce and wine in a small saucepan; bring to a boil. Spoon about 3/4 cup beef mixture into each pepper. Place peppers in a 2-quart baking dish coated with cooking spray; add wine mixture to pan. Cover with foil. Bake at 450° for 20 minutes. Uncover; bake an additional 5 minutes or until lightly browned. Serve peppers with sauce. Garnish with pepper tops. 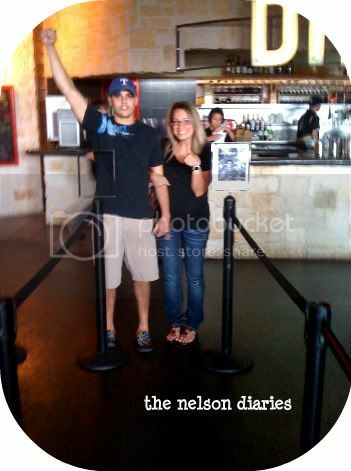 Oh, so yesterday I went with my husband and my friend Kelly to see Eclipse FINALLY! :) My thoughts? I liked it much better than the first two movies! I'm not a Twilight Saga addict my any means, but I will say I enjoy watching the movies. My friend Kelly loaned me the books, and so far I'm on Chapter 8 of Twilight hahahahaha. I have a long way to go! However, I do like the book much better than the movie so far, which I guess isn't suprising because I've heard this from A LOT of people. 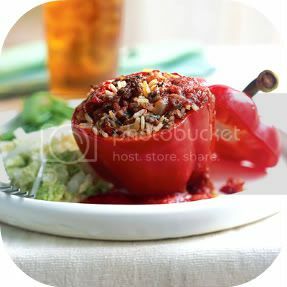 I would love to try the stuffed peppers they look awesome and sort of simple to make=) Love your blog really cute! I LOVE stuffed peppers, but have never had a recipe! THANK YOU!! Love your blog! It's way cute! Thanks for sharing some yummy recipes! Ok so those both had my mouth watering!! I love your header pictures too btw, so pretty! (Mari, Mr.& Mrs. Smith, and Our Little Family): Awww thank you guys! And you are welcome! :) Let me know how they turn out for y'all! Stopping by from Top 2 Tuesday, your blog is adorable!! Both of thos recipes sound so good, I'll add them to my list to try.